The new HR 1004 power harrow is designed to provide a smooth, level seedbed in one pass. Improved three-point lift and control and new side panels for better field finish are two of the redesigns on Kuhn North America's new HR 1004 power harrow series. An upgrade from the HR 1003 machines, the 1004 features an improved headstock design for more clearance and easier coupling to modern, large frame tractors. The machine is designed to provide a vertical-axis mixing action for horizontal cultivation that leaves soil layers in their original placement during fumigation and sterilization chores. The new line is available in rigid models from 9' 10" to 15' and vertical folding models which work 16' 5" and 20' widths with very narrow transport widths. The HR 1004 Series of power harrows from Kuhn North America is a refined version of the company's popular HR 1003 Series. 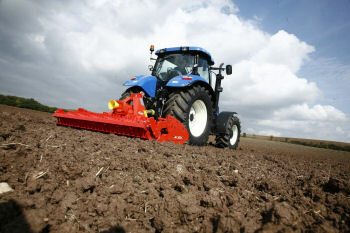 For more information on the new harrows, click on: www.kuhnnorthamerica.com.